The impressive Double Splash Slide is a dual wet or dry slide guaranteed to add tons of excitement and acceleration to any event.The bright and colorful blue-purple theme fits into any décor, sure to make a thrill-filling day, and keep the kids sliding! QUALITY SPACEWALKS AND WATERSLIDES AT AFFORDABLE RATES!!! All day spacewalk and water slide rentals are delivered between 7am-12pm. Pick up starts at 7pm. Note: We offer overnight stay for a great price!! 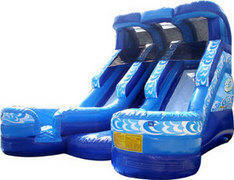 DND Inflatables, spacewalk and water slide rentals serving the New Orleans and surrounding areas.